It's not quiet the end of the month for my cookbook review, but I've made as many recipes as I'm going to over the last two months. The good - beautifully published cookbook with full color, full page photos of most recipes. It was given to me as a gift, and I'd recommend it for that just for how it looks. The instructions for each recipe are extremely detailed. Most lean toward complicated. Not only are the recipes well written, but most have a small "helpful hints" box at the end with additional information I found useful. Best recipe I made was Dark Chocolate Black Bottom Bites, also one of the easier recipes. The bad - Several recipes require special tools or single use items (i.e. 3 inch PVC pipe) that I didn't have, and since I cook a lot I generally have more gadgets than most. Most required ingredients I didn't have on hand and are expensive. For example, the Mandarin Orange Truffle Cake I made cost $31 dollars in ingredients for an 8 in, 2 layer cake. It was pretty good, but I have a bakery within walking distance of my house that makes delicious, homemade, all natural ingredients cakes where an 8 in. will run me about $16. It wasn't worth the cost or effort. Only one recipe didn't turn out for me at all, Pistachio Cigar Cookies. I attempted two batches and ended up throwing both out. If money and effort/ability aren't an issue for you, then this would probably be 5 stars. My feelings are more mixed. Between three and four stars. Easy to follow recipes, many that are not complicated or labor intensive, and most of which are accompanied by color photos. Recipes call for easily accessible ingredients. The "Mike's dark chocolate black bottom bites" are to die for! Oh, and if you'd like to find a cake that everyone will love, the "Caramel Chocolate Chip Cake" is delicous! 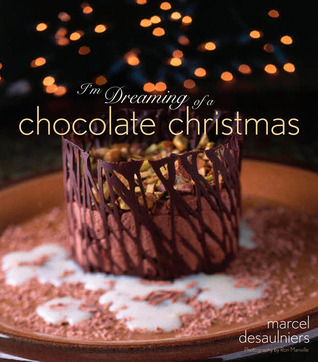 Not necessarily Christmas specific, as these chocolatey recipes will work any time of year. I would like to have seen a photo of every recipe, but many look delicious! I loved reading this book. But most of the recipes are way too hard for me. Awesome pictures and lots of Chocolate. Recipes that require tools? Sign me up!! Really liked the Polly Golly Doodles, and will be making the dessert on the cover for Christmas.